Thrust vectoring, also thrust vector control or TVC, is the ability of an aircraft, rocket, or other vehicle to manipulate the direction of the thrust from its engine(s) or motor(s) in order to control the attitude or angular velocity of the vehicle. In rocketry and ballistic missiles that fly outside the atmosphere, aerodynamic control surfaces are ineffective, so thrust vectoring is the primary means of attitude control. For aircraft, the method was originally envisaged to provide upward vertical thrust as a means to give aircraft vertical (VTOL) or short (STOL) takeoff and landing ability. Subsequently, it was realized that using vectored thrust in combat situations enabled aircraft to perform various maneuvers not available to conventional-engined planes. To perform turns, aircraft that use no thrust vectoring must rely on aerodynamic control surfaces only, such as ailerons or elevator; craft with vectoring must still use control surfaces, but to a lesser extent. In missile literature originating from Russian sources, thrust vectoring is often referred as "gas-dynamic steering" or "gas-dynamic control". Thrust vector control (TVC) is only possible when the propulsion system is creating thrust; separate mechanisms are required for attitude and flight path control during other stages of flight. Nominally, the line of action of the thrust vector of a rocket nozzle passes through the vehicle's center of mass, generating zero net moment about the mass center. It is possible to generate pitch and yaw moments by deflecting the main rocket thrust vector so that it does not pass through the mass center. Because the line of action is generally oriented nearly parallel to the roll axis, roll control usually requires the use of two or more separately hinged nozzles or a separate system altogether, such as fins, or vanes in the exhaust plume of the rocket engine, deflecting the main thrust. Thrust vectoring for many liquid rockets is achieved by gimbaling the rocket engine. This often involves moving the entire combustion chamber and outer engine bell as on the Titan II's twin first-stage motors, or even the entire engine assembly including the related fuel and oxidizer pumps. The Saturn V and the Space Shuttle used gimballed engines. Another method of thrust vectoring used on early solid propellant ballistic missiles was liquid injection, in which the rocket nozzle is fixed, but a fluid is introduced into the exhaust flow from injectors mounted around the aft end of the missile. If the liquid is injected on only one side of the missile, it modifies that side of the exhaust plume, resulting in different thrust on that side and an asymmetric net force on the missile. This was the control system used on the Minuteman II and the early SLBMs of the United States Navy. A later method developed for solid propellant ballistic missiles achieves thrust vectoring by deflecting the rocket nozzle using electric servomechanisms or hydraulic cylinders. The nozzle is attached to the missile via a ball joint with a hole in the center, or a flexible seal made of a thermally resistant material, the latter generally requiring more torque and a higher power actuation system. The Trident C4 and D5 systems are controlled via hydraulically actuated nozzle. The STS SRBs used gimballed nozzles. The Apollo Lunar Module had a fixed engine in the ascent stage. Attitude control was achieved by using 16 auxiliary reaction control system engines in four clusters mounted on the ascent stage. The descent stage engine gimbaled, but this was computer-controlled to keep the thrust vector aligned with the center of mass and attitude control was by the ascent stage RCS. The V-2 used exhaust vanes and aerodynamic vanes, as did the Redstone, derived from the V-2. Some smaller sized atmospheric tactical missiles, such as the AIM-9X Sidewinder, eschew flight control surfaces and instead use mechanical vanes to deflect motor exhaust to one side. Thrust vectoring is a way to reduce a missile's minimum range, before which it cannot reach a speed high enough for its small aerodynamic surfaces to produce effective maneuver. For example, anti-tank missiles such as the ERYX and the PARS 3 LR use thrust vectoring for this reason. Aster missile family combines aerodynamic control and the direct thrust vector control called "PIF-PAF"
AIM-9X uses four jet vanes inside the exhaust, that move as the fins move. 9M96E uses a gas-dynamic control system enables maneuver at altitudes of up to 35 km at forces of over 20g, which permits engagement of non-strategic ballistic missiles. 9K720 Iskander is controlled during the whole flight with gas-dynamic and aerodynamic control surfaces. Most currently operational vectored thrust aircraft use turbofans with rotating nozzles or vanes to deflect the exhaust stream. This method can successfully deflect thrust through as much as 90 degrees, relative to the aircraft centerline. However, the engine must be sized for vertical lift, rather than normal flight, which results in a weight penalty. Afterburning (or Plenum Chamber Burning, PCB, in the bypass stream) is difficult to incorporate and is impractical for take-off and landing thrust vectoring, because the very hot exhaust can damage runway surfaces. Without afterburning it is hard to reach supersonic flight speeds. A PCB engine, the Bristol Siddeley BS100, was cancelled in 1965. Tiltrotor aircraft vector thrust via rotating turboprop engine nacelles. The mechanical complexities of this design are quite troublesome, including twisting flexible internal components and driveshaft power transfer between engines. Most current tiltrotor designs feature two rotors in a side-by-side configuration. If such a craft is flown in a way where it enters a vortex ring state, one of the rotors will always enter slightly before the other, causing the aircraft to perform a drastic and unplanned roll. Thrust vectoring is also used as a control mechanism for airships. An early application was the British Army airship Delta, which first flew in 1912. It was later used on HMA (His Majesty's Airship) No. 9r, a British rigid airship that first flew in 1916 and the twin 1930s-era U.S. Navy rigid airships USS Akron and USS Macon that were used as airborne aircraft carriers, and a similar form of thrust vectoring is also particularly valuable today for the control of modern non-rigid airships. In this use, most of the load is usually supported by buoyancy and vectored thrust is used to control the motion of the aircraft. The first airship that used a control system based on pressurized air was Enrico Forlanini's Omnia Dir in 1930s. A design for a jet incorporating thrust vectoring was submitted in 1949 to the British Air Ministry by Percy Walwyn. Official interest was curtailed when it was realised that the designer was a patient in a mental hospital. Now being researched, Fluidic Thrust Vectoring (FTV) diverts thrust via secondary fluidic injections. Tests show that air forced into a jet engine exhaust stream can deflect thrust up to 15 degrees. Such nozzles are desirable for their lower mass and cost (up to 50% less), inertia (for faster, stronger control response), complexity (mechanically simpler, fewer or no moving parts or surfaces, less maintenance), and radar cross section for stealth. This will likely be used in many unmanned aerial vehicle (UAVs), and 6th generation fighter aircraft. Thrust-Vectoring flight control (TVFC) is obtained through deflection of the aircraft jets in some or all of the pitch, yaw and roll directions. In the extreme, deflection of the jets in yaw, pitch and roll creates desired forces and moments enabling complete directional control of the aircraft flight path without the implementation of the conventional aerodynamic flight controls (CAFC). TVFC can also be used to hold stationary flight in areas of the flight envelope where the main aerodynamic surfaces are stalled. TVFC includes control of STOVL aircraft during the hover and during the transition between hover and forward speeds below 50 knots where aerodynamic surfaces are ineffective. When vectored thrust control uses a single propelling jet, as with a single-engined aircraft, the ability to produce rolling moments may not be possible. An example is an afterburning supersonic nozzle where nozzle functions are throat area, exit area, pitch vectoring and yaw vectoring. These functions are controlled by four separate actuators. A simpler variant using only three actuators would not have independent exit area control. When TVFC is implemented to complement CAFC, agility and safety of the aircraft are maximized. Increased safety may occur in the event of malfunctioning CAFC as a result of battle damage. To implement TVFC a variety of nozzles both mechanical and fluidic may be applied. This includes convergent and convergent-divergent nozzles that may be fixed or geometrically variable. It also includes variable mechanisms within a fixed nozzle, such as rotating cascades and rotating exit vanes. Within these aircraft nozzles, the geometry itself may vary from two-dimensional (2-D) to axisymmetric or elliptic. The number of nozzles on a given aircraft to achieve TVFC can vary from one on a CTOL aircraft to a minimum of four in the case of STOVL aircraft. It is necessary to clarify some definitions used in thrust-vectoring nozzle design. Axisymmetric: Nozzles with circular exits. Conventional Aerodynamic Flight Control (CAFC): Pitch, Yaw-Pitch, Yaw-Pitch-Roll or any other combination of aircraft control through aerodynamic deflection using rudders, flaps, elevators and/or ailerons. Converging-Diverging Nozzle (C-D) Generally used on supersonic jet aircraft where nozzle pressure ratio (npr) >3. The engine exhaust is expanded through a converging section to achieve Mach 1 and then expanded through a diverging section to achieve supersonic speed at the exit plane, or less at low npr. Converging Nozzle Generally used on subsonic and transonic jet aircraft where npr<3. The engine exhaust is expanded through a converging section to achieve Mach 1 at the exit plane, or less at low npr. Effective Vectoring Angle: The average angle of deflection of the jet stream centerline at any given moment in time. Fixed Nozzle: A Thrust-Vectoring Nozzle of invariant geometry or one of variant geometry maintaining a constant geometric area ratio, during vectoring. This will also be referred to as a civil aircraft nozzle and represents the nozzle thrust vectoring control applicable to passenger, transport, cargo and other subsonic aircraft. Fluidic Thrust Vectoring: The manipulation or control of the exhaust flow with the use of a secondary air source, typically bleed air from the engine compressor or fan. Geometric Vectoring Angle: Geometric centerline of the nozzle during vectoring. For those nozzles vectored at the geometric throat and beyond, this can differ considerably from the effective vectoring angle. Three bearing swivel duct nozzle (3BSD): Three angled segments of engine exhaust duct rotate relative to one another about duct centreline to produce nozzle thrust axis pitch and yaw. Three-Dimensional (3-D): Nozzles with multi-axis or pitch and yaw control. Thrust Vectoring (TV): The deflection of the jet away from the body-axis through the implementation of a flexible nozzle, flaps, paddles, auxiliary fluid mechanics or similar methods. Thrust Vectoring Flight Control (TVFC): Pitch, Yaw-Pitch, Yaw-Pitch-Roll or any other combination of aircraft control through deflection of thrust generally issuing from an air-breathing turbofan engine. Two-Dimensional (2-D): Nozzles with square or rectangular exits. In addition to the geometrical shape 2-D can also refer to the degree-of-freedom (DOF) controlled which is single axis, or pitch-only, in which case round nozzles are included. Two-Dimensional Converging-Diverging (2-D C-D): Square, rectangular or round supersonic nozzles on fighter aircraft with pitch-only control. Variable Nozzle: A thrust vectoring nozzle of variable geometry maintaining a constant, or allowing a variable, effective nozzle area ratio, during vectoring. This will also be referred to as a military aircraft nozzle as it represents the nozzle thrust vectoring control applicable to fighter and other supersonic aircraft with afterburning. The convergent section may be fully controlled with the divergent section following a pre-determined relationship to the convergent throat area. Alternatively, the throat area and the exit area may be controlled independently, to allow the divergent section to match the exact flight condition. Geometric Area Ratios – Maintaining a fixed geometric area ratio from the throat to the exit during vectoring. The effective throat is constricted as the vectoring angle increases. Effective Area Ratios – Maintaining a fixed effective area ratio from the throat to the exit during vectoring. The geometric throat is opened as the vectoring angle increases. Differential Area Ratios – Maximizing nozzle expansion efficiency generally through predicting the optimal effective area as a function of the mass flow rate. Type I – Nozzles whose baseframe mechanically is rotated before the geometrical throat. Type II – Nozzles whose baseframe is mechanically rotated at the geometrical throat. Type III – Nozzles whose baseframe is not rotated. Rather, the addition of mechanical deflection post-exit vanes or paddles enables jet deflection. Type IV – Jet deflection through counter-flowing or co-flowing (by shock-vector control or throat shifting) auxiliary jet streams. Fluid-based jet deflection using secondary fluidic injection. additional type - Nozzles whose upstream exhaust duct consists of wedge-shaped segments which rotate relative to each other about the duct centreline. An example of 2D thrust vectoring is the Rolls-Royce Pegasus engine used in the Hawker Siddeley Harrier, as well as in the AV-8B Harrier II variant. Widespread use of thrust vectoring for enhanced maneuverability in Western production-model fighter aircraft didn't occur until the deployment of the Lockheed Martin F-22 Raptor fifth-generation jet fighter in 2005, with its afterburning, 2D thrust-vectoring Pratt & Whitney F119 turbofan. The Lockheed Martin F-35 Lightning II while using a conventional afterburning turbofan (Pratt & Whitney F135) to facilitate supersonic operation, the F-35B variant, developed for joint usage by the US Marine Corps, Royal Air Force, Royal Navy, and Italian Navy, also incorporates a vertically mounted, low-pressure shaft-driven remote fan, which is driven through a clutch during landing from the engine. Both the exhaust from this fan and the main engine's fan are deflected by thrust vectoring nozzles, to provide the appropriate combination of lift and propulsive thrust. It is not conceived for enhanced maneuverability in combat, only for VTOL operation, and the F-35A and F-35C do not use thrust vectoring at all. The Sukhoi Su-30MKI, produced by India under license at Hindustan Aeronautics Limited, is in active service with the Indian Air Force. The TVC makes the aircraft highly maneuverable, capable of near-zero airspeed at high angles of attack without stalling, and dynamic aerobatics at low speeds. The Su-30MKI is powered by two Al-31FP afterburning turbofans. The TVC nozzles of the MKI are mounted 32 degrees outward to longitudinal engine axis (i.e. in the horizontal plane) and can be deflected ±15 degrees in the vertical plane. This produces a corkscrew effect, greatly enhancing the turning capability of the aircraft. A few computerized studies add thrust vectoring to extant passenger airliners, like the Boeing 727 and 747, to prevent catastrophic failures, while the experimental X-48C may be jet-steered in the future. Examples of rockets and missiles which use thrust vectoring include both large systems such as the Space Shuttle Solid Rocket Booster (SRB), S-300P (SA-10) surface-to-air missile, UGM-27 Polaris nuclear ballistic missile and RT-23 (SS-24) ballistic missile and smaller battlefield weapons such as Swingfire. The principles of air thrust vectoring have been recently adapted to military sea applications in the form of fast water-jet steering that provide super-agility. Examples are the fast patrol boat Dvora Mk-III, the Hamina class missile boat and the US Navy's Littoral combat ships. Thrust vectoring can convey two main benefits: VTOL/STOL, and higher maneuverability. Aircraft are usually optimized to maximally exploit one benefit, though will gain in the other. ^ "AA-11 ARCHER R-73". Retrieved 2014-03-27. ^ a b George P. Sutton, Oscar Biblarz, Rocket Propulsion Elements, 7th Edition. ^ "Reusable Solid Rocket Motor—Accomplishments, Lessons, and a Culture of Success" (PDF). ntrs.nasa.gov. Retrieved February 26, 2015. ^ a b "Anti-tank guided missile developments". Retrieved 2014-03-27. ^ "Combat Vehicle Tor 9A330". State company "UKROBORONSERVICE". Retrieved 2014-03-27. ^ "S-400 SA-20 Triumf". Federation of American Scientists. Retrieved 2014-03-27. ^ Mowthorpe, Ces (1998). Battlebags: British Airships of the First World War. Wrens Park. p. 11. ISBN 0-905778-13-8. ^ Abbott, Patrick (1989). The British Airship at War. Terence Dalton. p. 84. ISBN 0-86138-073-8. ^ "STOCK IMAGE - A 1949 jet deflection vectored-thrust propulsion concept by www.DIOMEDIA.com". Diomedia. ^ P. J. Yagle; D. N. Miller; K. B. Ginn; J. W. Hamstra (2001). "Demonstration of Fluidic Throat Skewing for Thrust Vectoring in Structurally Fixed Nozzles". Journal of Engineering for Gas Turbines and Power. 123 (3): 502–508. doi:10.1115/1.1361109. ^ a b c d "F-35B Integrated Flight Propulsion Control Development" Walker, Wurth, Fuller, AIAA 2013-44243, AIAA Aviation, August 12–14, 2013, Los Angeles, CA 2013 International Powewred Lift Conference"
^ a b "F-35B Lightning II Three-Bearing Swivel Nozzle - Code One Magazine". codeonemagazine.com. ^ "F-22 Raptor fact sheet." U.S. Air Force, March 2009. Retrieved: 10 July 2014. ^ "Air Attack - Fighters and more". www.air-attack.com. Archived from the original on 2010-09-17. ^ a b Gal-Or, Benjamin (2011). "Future Jet Technologies". International Journal of Turbo and Jet Engines. online. 28: 1–29. ISSN 2191-0332. ^ a b Sweetmano, Bill (1999). 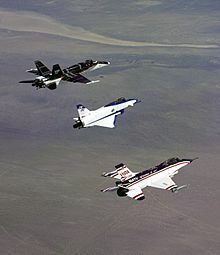 Joint Strike Fighter: Boeing X-32 vs Lockheed Martin X-35. Enthusiast Color Series. MBI. ISBN 0-7603-0628-1. ^ "Images show China's J-20 possibly equipped with new engines - Jane's 360". www.janes.com.